If you know me by now, you know that I love supporting local businesses. This is especially true with restaurants, and I refuse to eat at chains if a local option is close in proximity. 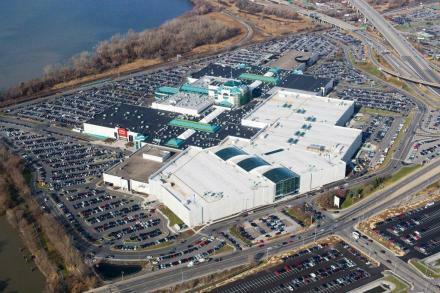 I’m also not a fan of the former Carousel Center, which is now Destiny USA. Kidding. This is actually what the builder wanted it to look like. Funny… this is the first picture that comes up when you Google it. To give the out-of-towners a quick synopsis: Years ago a contract was made. In the past few years, the contract has been revisited, and it’s now clear that the owner/builder is tax-free for 30 years. This gives nothing monetary to the City of Syracuse, which has seen its better days. I love my home city, and nothing bad should happen to it. A lot of people still applaud this place as a reliable attraction to bring in outsiders. That’s absolutely true. I consider it the same. Destiny USA will bring people to Syracuse. However, I view this mall as a big fishing lure. People are fish, and they will flock to this white and obnoxious green tourist attraction, and they will get hooked. The mall has so many retailers, big names in fact, and several forgotten small stores that come and go more often than not. But please, don’t follow the yellow brick road to this perceived glorious nook within the Emerald City. Follow the road Downtown. 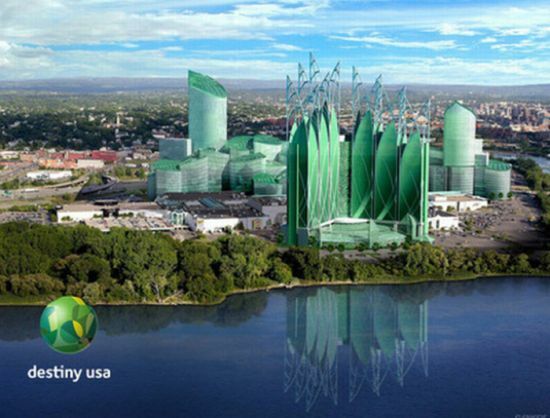 Yes, one of Syracuse’s nicknames is The Emerald City. Frankly, I like it; this name alludes to many aspects. Thank you, U.S. Airways. Thankfully Destiny USA is–as it’s told to us–supposed to be environmentally-focused. How would I like to see it? Let the people flock to Syracuse for Destiny USA. They’ll realize the mall is filled with chains they’ve eaten at before. Sure, you can eat in the veranda of the chains, but you’re looking out into a lovely cold atmosphere that is… a mall. Syracuse has a lot to offer. We have so many locally-owned-and-focused businesses. Once visitors take a step into the surrounding areas, you’ll see how amazing our city really is. When you come to visit Syracuse, it’s up to you whether to shop at the mall. Just don’t spend a lot there. Go for an adventure, get out, and talk to people. Ask us locals where to go. Buy some records/CD’s that will make up the soundtrack to your trip. Eat some fantastic food, which comes from local farms. The World of Beer is a chain pub with a copious amount of beer on draft and in bottles. I cannot begin to explain to you how many varieties and crafts there are. World of Beer boasts big names and crafts. 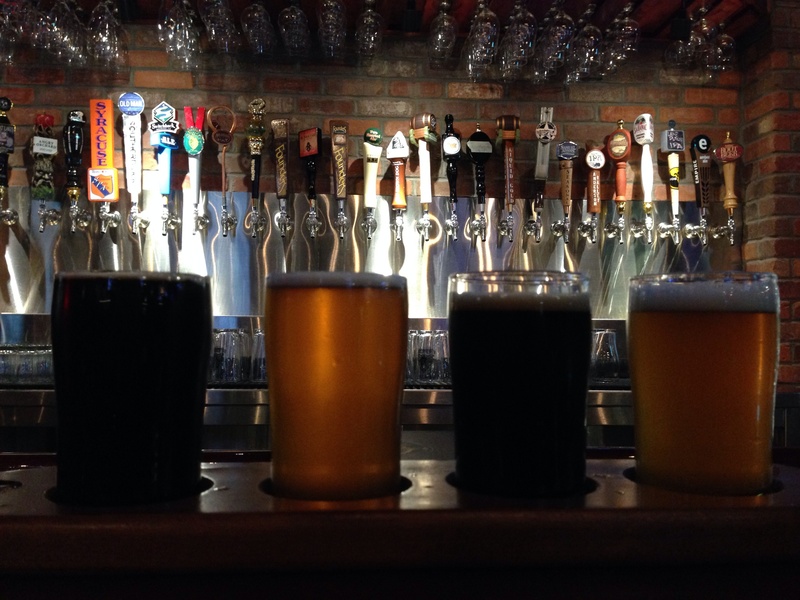 The venue boasts a favorable roster of New York state beer, including the Upstate and Central New York squad. John from Queens was leaving town the following day, so I met him and his brother at the venue. John knows me and my local preferences. However, I’d take a bullet for the guy if the moment should ever arise. Justin and Jeremy joined us as well, which was a nice surprise for me. The day I visited WOB was December 29th. At this time, I had not seen Jeremy in well over a decade. Many familiar CNY faces, especially those in the restaurant/beer industry were present. It felt like a downtown venture aside the veranda sticking out into the mall atmosphere. Decisions could not be made, so the smart move was to create a flight. There are flight options listed, but you can create your own. Mine consisted of Dogfish Head World Wide Stout, Dark Horse Crooked Tree IPA, Brooklyn Fire and Ice (porter), and Captain Lawrence Freshchester Pale Ale. The Dogfish Head is 18%, so that was consumed last; and it was shared. The audacity to ask the waitress about the local attitude of WOB arose early, and she was a great sport. She was honest and said that their local contribution is beer-related. The food isn’t so much. I thanked her for her honesty. The overall experience, aside my friends in company, was great. The staff was fun and courteous. Aside H&M and the movies, I have a new reason to go to Destiny USA. However, when the movie theater opens in Camillus, there will be one less reason to. Yick. Malls are the worst. Sorry, it took so long for me to reply. I’m the worst. I don’t play video games, but… that’s kind of how it feels when I have to go to the mall, like I’m on a dangerous mission and I’m trying to dart around all sorts of obstacles and threats. Exactly! The only exception is that you’ll find loose change here and there, which doesn’t add up to anything. The only items you can pick up, you don’t want to. In order to advance to the next level, one can either (a) take the stairs, (b) take the escalator, or (c) take the elevator. Ok I totally fell for the first picture and was all like “wow….how have I never heard of this place?”. 🙂 Oh well. What can I say. I’ve never been to New York.